What a difference a year makes! 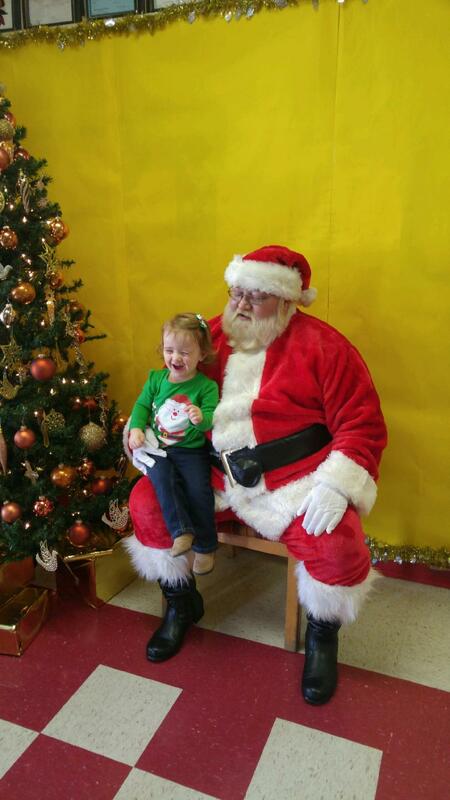 Alexis was much more into Christmas this past year. From shopping to wrapping presents, seeing Santa and looking at Christmas lights she thoroughly enjoyed every bit of it. And I must be getting a handle on this whole mom thing seeing as how this go 'round I'm posting about Christmas in the first week of January instead of almost February. Things got started off a little rough. Alexis got a terrible stomach bug that lasted about six days. As a result we missed two family celebrations. She was better for Christmas day, thankfully. 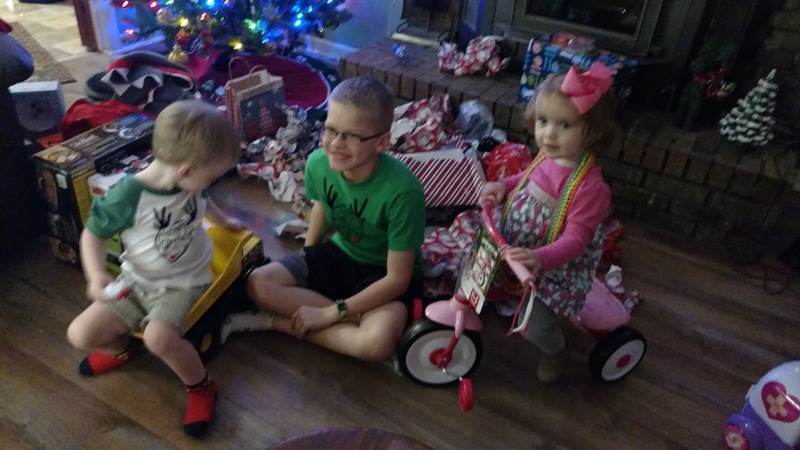 We started the day off with just the three of us, then went to Christmas breakfast with my in-laws, and ended the day with my parents and brother. We celebrated with my in-laws and Chris' brother's family the next day. 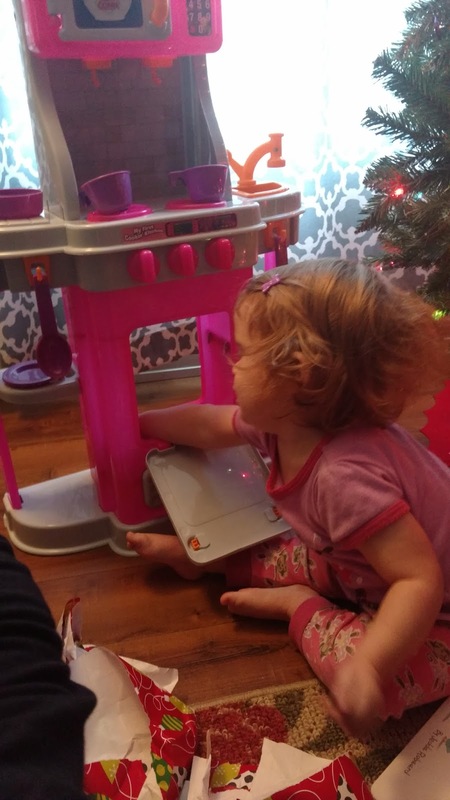 So what do you get an almost-two-year-old for Christmas? 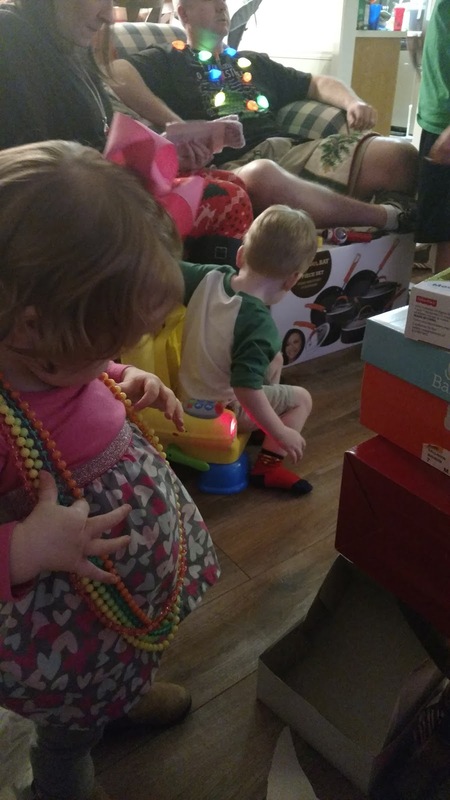 Our "big" gift was a kitchen, but we also got our little bookworm a new book, a Mickey Mouse puzzle, one of those popper things, and some hair bows. 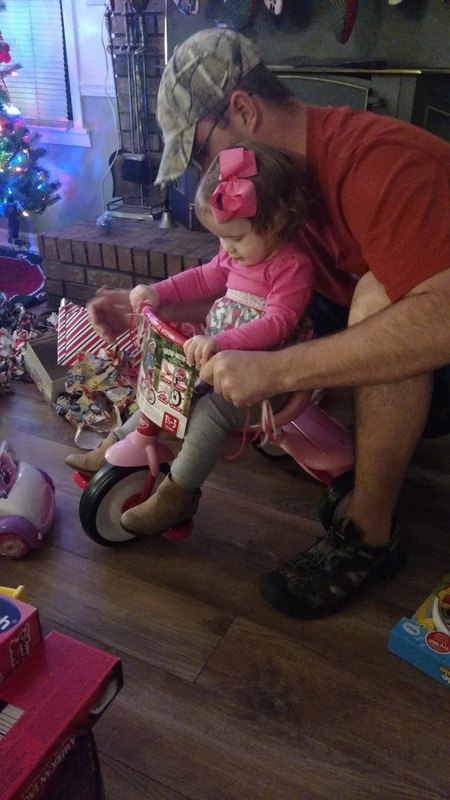 Some of the other things she got include a pink cozy coupe car, tricycle, beads, babies, and Princess Sophia figurines. This year she was more into opening presents, which was a relief because last year she really didn't like the sound of tearing wrapping paper. She and our nephew who's a month older also actually played together this year. 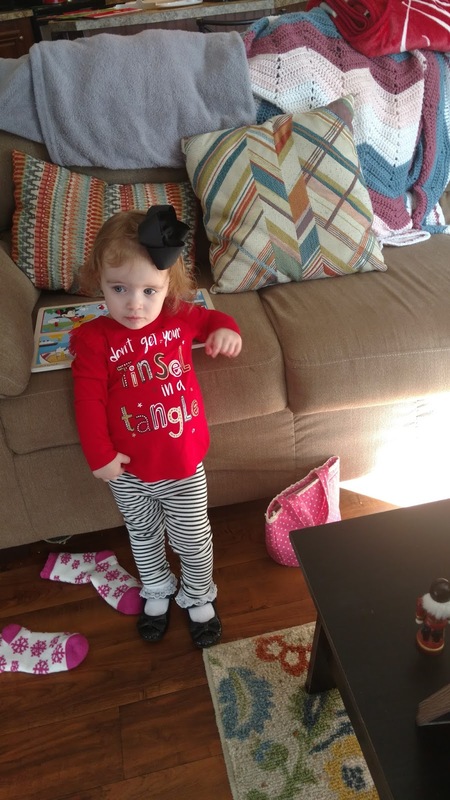 Do you know how hard it is to get two toddlers to look at the camera at the same time? Impossible. Speaking of toddlers ... Alexis is officially one. It's been awhile since my last update on her, so I figured we're due. She's super opinionated and not afraid to tell you "no" when she doesn't like something or want to do something. She just moved up a class at daycare, and we're starting to potty train. 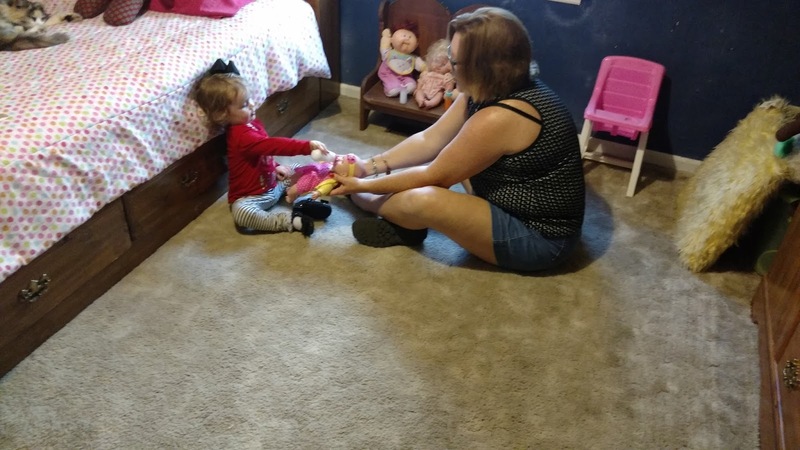 She graduated from a crib to a toddler bed back before Thanksgiving. She's very social and loving but also can play by herself and doesn't need constant interaction. She likes to play with all my hair stuff (headbands and curlers are her favorite) and loves jewelry. She knows almost all her body parts, can name all the characters on Mickey Mouse Clubhouse, loves the dog and playing outside. She's the happiest child I've ever seen on most days and everyone she meets falls in love with her. She might be just little bit spoiled but generally speaking is better behaved than a lot of school-age children I know. There's never a dull moment with her, and I wouldn't have it any other way. Thanks for showing us what Christmas was like for your family and especially your dear little Alexis. It's a shame she took ill during the season but I'm thankful that she recovered in time to enjoy the big day. She is precious and I can understand how proud you are of her. I love that red tinsel shirt she was wearing that day! Our grandson will be two years old in May and Mrs. Shady and I bought him a kitchen for Christmas, too. He is a budding chef, fascinated with mommy and daddy's real kitchen, and he loves to play with his very own stove, sink, cupboards, pots, pans and dishes. 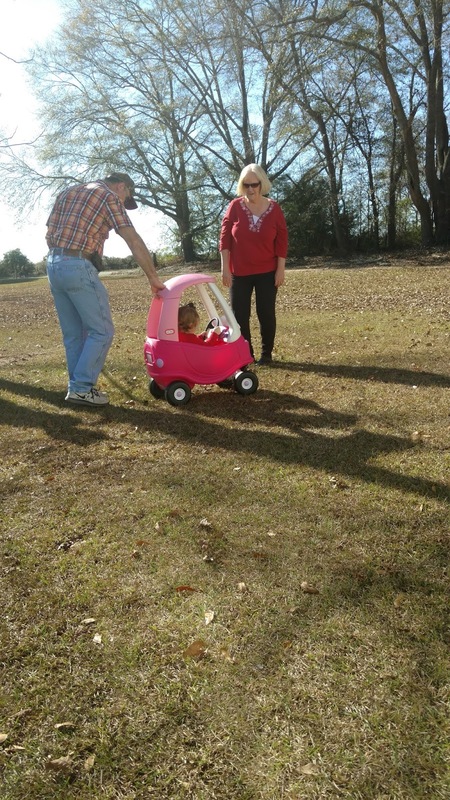 Years ago we bought one of those little cars for our toddler granddaughter and I used to push her around in it. Now she's 19 and in college! Time passes very quickly as you know, so enjoy your daughter through every stage of her development.